Supporters of Chinese official Zhang Zhijun, Director of the Taiwan Affairs Office, display banners reading ‘warm welcome to the visiting Zhang Zhijun’ in New Taipei City, June 26, 2014. China’s most senior official ever to visit Taiwan met his counterpart to try to improve relations after mass protests in Taipei earlier this year, sparking angry confrontations between protesters and riot police. Before Chinese President Xi Jinping had a dream, his predecessor Hu Jintao had a wish: the “peaceful reunification” of China and Taiwan. In fact, all of Xi’s predecessors since Mao Zedong founded the People’s Republic of China in 1949 have pined for the reabsorption of Taiwan into the motherland—it has always been one of China’s self-defined “core interests,” and its paramount foreign policy goal. Among the roughly half-dozen men who have sat atop the ruling Communist Party firmament, Xi is the one who has brought China closest to achieving this goal: he’s maneuvered the self-governing island of Taiwan nearer to the mainland than it has been at any point in modern history. And with the historic meeting between Xi and Taiwan’s President Ma Ying-jeou, scheduled for November 7, Xi may have taken one large step closer to realizing it. Yet from the perspective of a man keen to tighten his party’s grip on power, some dreams may be better left deferred. In soft power, especially in regards to democracy and human rights, Taiwan punches far above its weight. In a February 2014 meeting with Lien Chan, a former premier of Taiwan, Xi stressed that China’s 1.3 billion people and the 23 million Taiwanese share the same dream for “the great rejuvenation” of the Chinese nation—which, in this case, includes reunification. That dream will be realized regardless of any difference “of political parties,” Xi said. This is naive. Not only do a majority of Taiwanese favor the status quo of self-governance, but the biggest gap between the two polities is their political systems: China remains an authoritarian one-party state, while Taiwan is a healthy and raucous democracy. Bringing the two sides closer together not only may warp Taiwan’s democracy, which many on the island fear—but could also nudge China towards a more democratic future, a great and seemingly unobtainable hope for many on the mainland. The last several years have seen marked convergence between China and Taiwan. Beijing’s official policy since Mao and his Communist Party defeated the Nationalists in the civil war in 1949 has been that Taiwan belongs to China. 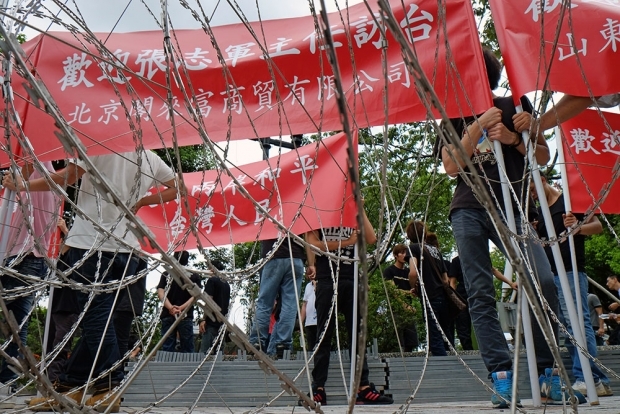 In 2005, Beijing promulgated an anti-secession law stating that Beijing reserves the right to use “non-peaceful means” to force Taiwan’s reunification. Switching to a gentler approach in 2008, after the election of the more pro-China Ma, the two sides resumed high-level talks. Tighter trade links followed soon after: Ma prioritized cross-straits business ties, and China is now Taiwan’s largest trading partner by far. Dozens of direct flights now connect the two countries, up from zero in 2008. Confabs between representatives of the two sides have steadily increased in importance, culminating in November 7’s first-ever meeting of the two heads of state in Singapore. Although this is unlikely to produce any deliverables—Ma’s office even promised that Ma won’t sign any agreements with Xi—the symbolism of the two men even speaking to each other is immensely significant. In this increasingly close relationship, China is the dominant partner: it is far larger in size, population, economy, and global sway. Although militarily the United States is required to arm Taiwan, and maybe even defend it from a Chinese attack, Beijing still has an estimated 1,200 missiles directed at the island. And yet, power and influence doesn’t only flow one way. Taiwan has long influenced the mainland—culturally, religiously, and politically—and to some liberals in China’s party establishment, the mere existence of Taiwan represents the best hope for Chinese democracy. In his February 2014 meeting, Xi claimed that the Chinese and Taiwanese possess the same spirit, culture, and blood. That may be true—but the Taiwanese are also living proof that modern and successful Chinese can oppose Communist Party rule and support democracy. Taiwan’s existence shows the lie behind Beijing’s longtime assertion that Chinese aren’t fit for democracy. In particular, Taiwan’s existence shows the lie behind Beijing’s longtime assertion that Chinese aren’t fit for democracy. “China can tell you, ‘with our 5,000 years of Confucian society, democracy doesn’t work,’” the popular Taiwanese writer and critic Lung Ying-tai told journalist Richard Bernstein. “But with Taiwan, you can imagine China differently.” Taiwan, Ma told students at Stanford University in 2013, “represents a shining example of how democracy can take root in the Chinese-speaking world.” For the first time in Chinese history, he added, “we in Taiwan have proved that democracy can thrive in a Chinese society. It presents a shining ray of hope to the 1.3 billion Chinese people on the mainland.” As more and more Chinese come to Taiwan—in 2014, mainland Chinese made nearly 4 million trips to Taiwan, up from just 55,000 in 2008—they have the opportunity to learn, if they choose, how the Taiwanese system works. Because it emerged from the middle of the 20th century relatively unscathed—Taiwan fared much better than the mainland during its period of Japanese occupation, and didn’t suffer the indignities of 29 years of Mao’s rule—Taiwan has also done a far better job of protecting and preserving Chinese culture, from Buddhism, to ancestral worship, to tea ceremonies, among other traditions. Because the Communist Party strives to identify itself as synonymous with China, Taiwan’s cultural bona fides are important. When he fled China in 1949, Chiang brought with him crates containing some of China’s most valuable cultural heritage—including an idiosyncratic and priceless jade cabbage—and established Taipei’s National Palace Museum. That museum now contains the most extensive collection of Chinese art and artifacts anywhere in the world—an embarrassment for the Communist Party, which facilitated the looting and destruction of countless Chinese artifacts during the 1966 to 1976 Cultural Revolution. “Now the main way Taiwan projects its soft power is this idea of Taiwan as the preserver of traditional Chinese culture,” Gary Rawnsley, a professor of public diplomacy at Aberystwyth University in the United Kingdom, told the Los Angeles Times. Taiwan is also an important source of a relatively new cultural export to China: Christianity. Taiwanese Christians, especially Catholics, play an outsize role in proselytizing and organizing Christians on the mainland. Taiwan’s Catholics maintain an active network among China’s underground Churches, and as of 2012 Taiwan (along with Hong Kong) print “all of the orthodox canon laws, bibles, and other sacred books that China’s Catholics read,” according to a study on cross-strait religious relations. That Vatican City still recognizes Taiwan and not mainland China gives Taiwan an outsized importance for the millions (or tens of millions) of Catholics in China. To be sure, Ma may not have the influence in Taiwan to actually bring the two sides closer together. Only several months away from the end of his second and last term in office, Ma’s approval ratings remain mired in the low double digits. The opposition Democratic Progressive Party (D.P.P. ), who appeals more to the pro-independence section of Taiwanese society, is almost certain to win the presidential election in early 2016. “The people will never accept that an outgoing president bargains away Taiwan’s future to maximize his personal political legacy, or makes promises he cannot be responsible for,” the D.P.P presidential candidate Tsai Ing-wen said, in a sharply worded statement released on November 4. Then again, with the precedent already set, it’s possible that Tsai, likely Taiwan’s next president, will choose to continue the tradition of meeting with Xi. Even if the meeting creates a backlash in Taiwan, it could reverberate among Party cadres in China. Chinese liberals in the Communist Party already see Taiwan as a possible force to nudge the mainland towards democracy. An influential Chinese academic told me how he thinks reunification could work on the political level: the Chinese government would evolve into a political body with two houses, similar to the U.S. Congress. Mainland China would dominate one house, whose members would be elected from each Chinese province and from Taiwan by population. The other house would be made up equally of Mainland Chinese and Taiwanese. Unlikely, yes—but a sign of how the dream of Taiwan’s absorption stimulates creative political thinking in the Chinese body politic.